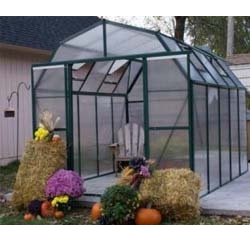 This barn style roof greenhouse will make a great addition to any backyard. The green powder coated aluminum provides a beautiful finish that will enhance any garden area. The higher side walls provides for ample headroom even when working close to the side wall. The covering material is 10mm twin-walled polycarbonate to provide long lasting durability and protection for your plants.